Relationship building: The driving force behind Michael Lancaster’s success as a businessman in the Green Industry. “Everybody can mow grass,” says Michael Lancaster, president of Florida Landscape Consultants (FLC). That’s why he stresses the importance of building relationships. Lancaster, 54, has worked as a sales representative, business owner and consultant for nearly 30 years in the Green Industry. During that time, he’s seen how relationship building—with other business associates and with customers — can affect success. To that end, Lancaster attributes FLC’s fast-track growth to the bonds he’s formed with customers and colleagues. The Tampa, Fla.-based company is on pace to generate $4 million in 2014 and $10 million by 2017. He started the company in 2012. Lancaster entered the landscaping and lawn care business in the 1980s. He was working as a district sales representative for General Foods Corp. when a friend asked him if he’d like a sales position at ChemLawn’s commercial business unit in Tampa. He said yes and took a crash course on agronomy and horticulture. Despite having no experience in the Green Industry, Lancaster quickly became a top sales representative. In 1991, he decided to start his own commercial landscape business. 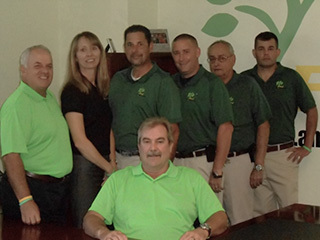 After five years, Nanak’s Landscaping in Tampa purchased it, retaining Lancaster as an independent marketing consultant for nearly 16 years. Lancaster witnessed firsthand the importance of customer relationships three years ago when ValleyCrest then acquired Nanak’s. He was displeased with the direction the company was heading, so he left after about a year to form his own firm with longtime coworker Beau Bohannon, who was a regional vice president at Nanak’s. Lancaster handles most of the marketing and financial facets of FLC, while Bohannon is responsible for the operations. The company provides landscape maintenance, tree care, irrigation, design and outdoor lighting services for commercial clients. The duo relied on its experience and reputation to build FLC’s client base. Ultimately, it was a clash in management philosophies that led Lancaster to strike out on his own. He says ValleyCrest’s leadership team redesigned labor budgets, changed account managers and split business among various branches. That meant, without an explanation, many customers lost account managers who had worked with them for years. The company lost a lot of business, Lancaster says. That culmination inspired him to go back into business for himself, bringing along Bohannon, who has many years of operations experience to complement his sales/marketing focus. Employee empowerment is important for any business that’s planning for long-term success, he adds. Account managers must have administrative skills and take ownership of their properties, Lancaster says. He also believes in promoting internally. Green Industry veteran Michael Lancaster offers his top tips for customer loyalty.